I'll let you all know the story behind this one: I started with the background first. I had a general idea, but I tried various combinations before I found the perfect one and the perfect texture! It wasn't that hard. 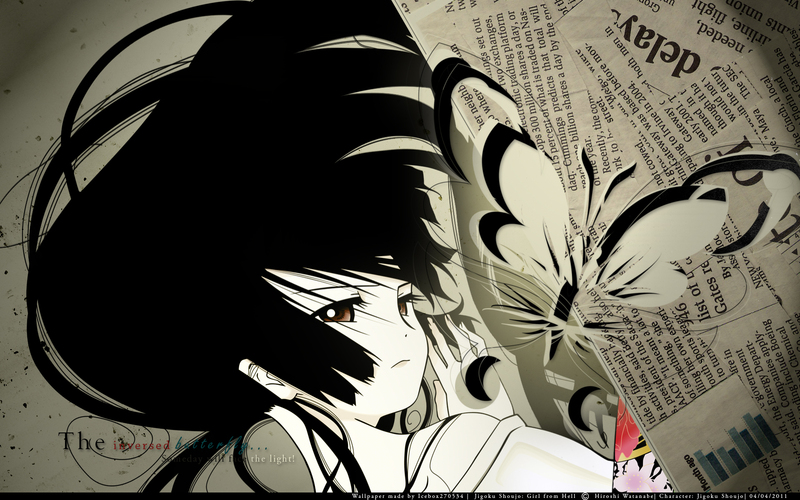 I personally loved Jigoku Shoujo, and Ai. Reasons why include her attitude; the way she acts. Then there's the type of girl I like; even if it were a drawing, it's preferred as a girl with straight si-- I will stop rambling. Anyhow, I enjoyed this wallpaper. I'd say it's creative to use the lyrics and a newspaper, considering the song that is; Sakasama no Chou. Not much else I could add, so basically; Good work! Edit; Forgot to add - +Fav. I rarely fav things, let alone walls. Love this, though. You you it together really well. It's really beautyful :) The vector fits the background perfectly. Great job! very nice. I like how you captured the picture, yet didn't overload it, and also added a small amount of color to bring depth to the picture while staying focused on Ai as well as the butterfly which didn't consume the picture yet sat nicely over in the corner, also the detail to the newspaper in the background just made it complex and blend with the butterfly even more. Very creative with the butterfly cut out, I like it. The simplicity is very nice. Very nice vector, particularly in the background like a butterfly. I'm not a very big fan of the Jigoku Shoujo series, but Ai is one of a few factors that make it appealing. And the fact this wall is dedicated to her makes it even more beautiful. but i love Enma Ai XD She is really cute. ~Fav! nice. good job on this one! Sweet! This is so stylish! Thanks for sharing it!